Set in a circus tent, the play will reinterpret Shakespeare’s The Tempest by adapting it to an Indian context and using circus and other subaltern forms of performance. With a spectacular show that comprises the entire gamut of circus, magic, illusion techniques, gypsy art, puppetry, martial arts, new media, dance, music and theatre, this extraordinary project blends the modern and the traditional through a new oral and visual language. 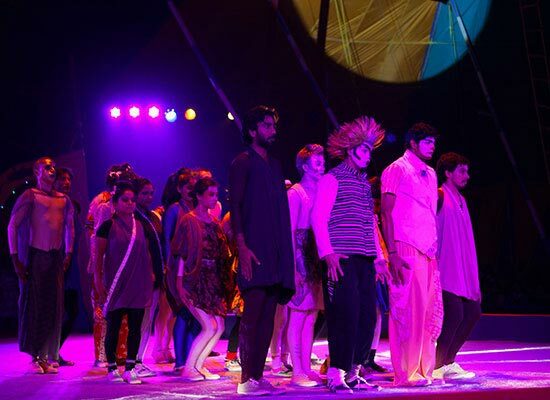 The Tempest is one of Shakespeare’s most dynamic plays that perfectly lends itself to regional adaptation in India. The backdrop of the sea, for example, is a motif that both the actors from Kerala and the audiences in Goa can easily relate to, and becomes symbolic of the nostalgia that this production aims to capture. The text for this production aims to transcend the barriers of language through minimal multi-lingual dialogue and pure visual expression. The story of The Tempest turns to fantasy and magic to aid the plot, thus giving immense space to explore circus techniques.